We are the leading supplier of all type of floor tiles in INDIA .We are the also supplying Kajaria 900X1800 Flexible Tiles. we offering a wide range of White Kajaria Floor Tiles. Procured from reckoned Kajaria brand, we haveintroduced Kajaria Ceramic Floor Tiles. These tiles as integrated with excellent finish and exclusive designs, the preferred range has gained huge industry acceptance. 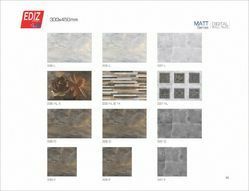 Customers can use these tiles for wall & flooring needs, available at reasonable rates. Rama Krishna Ceramics Pvt. Ltd. Premium Quality with best price to make the best deal. Jai mata marble always dealing with products with quality and tries best to satisfy customers for long.